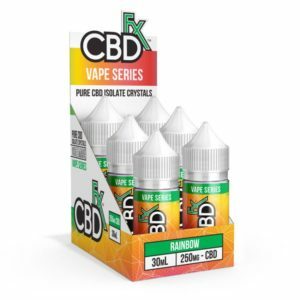 The CBDfx vape series is the best tasting vape juice available. Flavors like Strawberry/Kiwi, Fruity Cereal, Wild Watermelon and Strawberry Milk. These flavors combines innovation with nostalgic flavors you will love. Having an optimized PG/VG ratio and 3 different levels of CBD ensures the perfect dosage every time. The CBDfx series come in 6 different flavors along with 3 different flavors of Anml Alchemy E-liquid that uses CBDfx CBD oils. Flavors are available in 250mg, 500mg and 1000mg dosages.